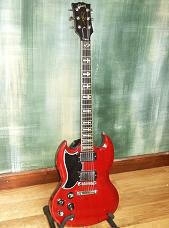 Home » Red Gibson Custom Shop S.G. This guitar was built by the Gibson Custom Shop in Nashville and finished in October 1997. 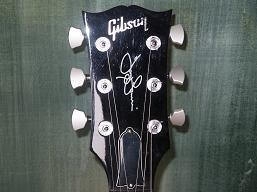 It is to Tony’s specification and was one of two prototypes of the Gibson Custom Shop Limited Edition Iommi Special S.G. It features 24 frets, cross inlays, four controls (bridge p.u. 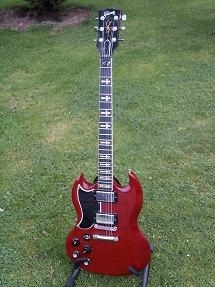 tone disconnected), Sperzel machine heads and Tony Iommi Signature Pickups as made by Gibson. On the 2007 tour, this was the main instrument for the ‘three down’ C# tuning although on the 2005 US Ozzfest tour it was the backup to the Black Custom Shop prototype.